Being one of the top rated dealerships in North Carolina not only does Sport Durst sale tons of cars, they service tons too! 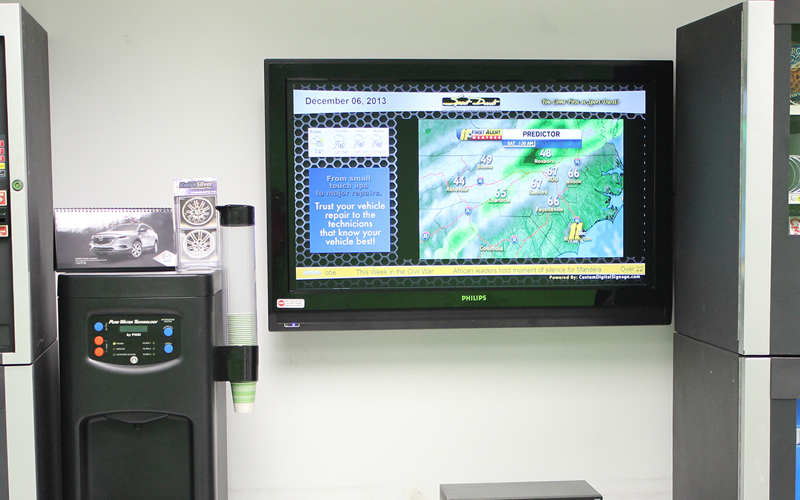 When it came to their service center, they knew they needed to update in a way that not only entertained their customers but kept them up to date on current events and promotions going on in at the dealership. They tried to implement a digital signage system that did show advertisements but they soon found their customers unhappy with the lack of TV. The solution required not only knowledge but a custom strategic approach to the situation. When it came to implementing a unique solution to boost their customer experience, Sport Durst Automotive needed something that not only helped their marketing but kept their customers happy. We custom built a media player that could handle a direcTV feed and also display animated advertisements alongside. We were able to help Sport Durst update their service center digital signage with a solution that was not only better than their previous system, but also eliminated the hassle of customers not being able to enjoy their TV experience while waiting for their fix to be finished.